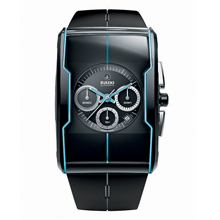 In the new Rado R-One Limited Edition, Rado propels watch design well out of the orbit of tradition and convention. Its dramatic shape, inspired by intergalactic travel, houses an unusual combination of high-tech materials, signed off with icy blue detail. 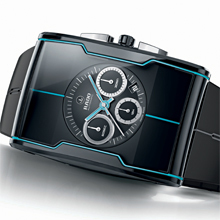 The appearance of the finished chronograph resembles a picture of the earth’s atmosphere taken from space. Silver-coloured metallic and icy blue luminous detail shimmer against a profound and mysterious black background. Three round chronograph discs characterise the dial like perfectly formed planets, legible signatures of the futuristic theme. Each of the 300 pieces that make up the limited edition comes in its own wooden presentation box, mirroring the watch’s shape and protecting it like a time capsule. 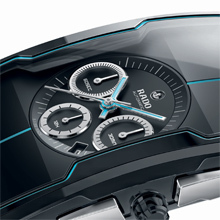 Viewed from any angle, the Rado R-One is the shape of things to come, exploring exciting new design territory. The shaping of the Rado R-One Automatic Chronograph constitutes an intriguing combination of elongated rectangular elements and gentle curves that confidently take modern materials to new physical limits. The fixation of the curved sapphire crystal to the complex structure represents a tough technical challenge due to the angular shaping of the watchcase and the seamless accommodation of the chronograph pushers. Dial design focuses on a dynamic, user-friendly interaction of straight lines and perfect circles. Round counters in applied steel stand out against the sleek black high-tech ceramic, harmonising with ultra-modern blue luminous hands and a matching fine straight line linking 12 o’clock and 6 o’clock. Acting as the chronograph’s operational cockpit are a round, steel, ceramic-capped crown and steel pushers. Teleporting accurate timekeeping to the dial of the Rado R-One is a six-hand, Swiss-made automatic chronograph movement, one of the smallest ever produced and incorporating a power reserve of 37 hours. A date window midway between three o’clock and four o’clock follows the circular path of the number markings. The case is a masterpiece in terms of creativity and durability thanks to ultra-resistant high-tech ceramic and an expertly adhered, domed sapphire crystal. Its robust attachment comes in black rubber strap, incorporating a fine grey line for visual continuity and a titanium three-fold buckle with a high-tech ceramic black cover. Adventurous wearers wishing to stand out from the crowd, as well as avid watch collectors, are certain to gravitate towards this cosmic creation.